Christians are Hypocrites | Whattaya Do? If you’ve ever brought up religion in a conversation and told people you were a Christian, you may have heard this response: “Christians are hypocrites. Christians say one thing and then do another. They talk about living a holy life and how we have to do the same. Everyone knows that they don’t live that way themselves.” Sound familiar? Ask a question: Is the truth about Jesus and Christianity contingent on it’s followers? In other words, do the actions of hypocritical people change the facts about Christianity? The simple answer to that question is NO! The moral inability or hypocritical living of people has no bearing on the truth of Christianity, however it does have a bearing on it’s reputation. The followers of Jesus are to be loving, truthful, humble, patient, kind, meek, gentle and respectful. When Christians do not act they way they are commanded to in the scriptures, it brings reproach on the name of Jesus and damages it’s reputation. Christians are people who’s hearts have been changed by God and are growing in the fruit of the Spirit. This fruit is a sign that they’re Christians, but it often takes some time for this fruit to grow. On the other hand, there are people who claim to be Christians and continue to live purposely sinful lives. They truly are hypocrites! Unfortunately, they damage the cause of sincere Christians who have been changed by the power of God and do actually follow Jesus. These hypocrites will face the judgment just like everyone else and their hypocrisy will be evident to everyone. Their judgment will actually be harsher since they claimed to know better. A real Christian may slip into sin, but they will never never stay there. So, yes, some so-called “Christians” are hypocrites. However, neither true followers of Jesus, or the hypocrites who say they follow him, have any bearing on the facts of Christianity. Those facts stand or fall on their own merit and cannot be changed by human behavior. If you research Christianity, you will find out that Jesus was a real historical figure who died and was resurrected three days later. You will find out that the gospels are historically accurate. And, you will find out that Jesus has dramatically changed countless lives for the better. Remember this, if you’re watching a Christian who is acting hypocritical, it’s best to check out who they say they’re following. Never judge a faith by it’s followers, judge it by it’s leader. In the case of Christianity, that would be Jesus. I’m confident that you’ll be moved by his life as I was. So, know you know Whattaya Do. Thanks for asking. Evolution: Science Fable, or fact? Think God started Evolution? Think again! Gospel contradictions as a source of confidence? Sorry- No, you can’t have it your way! We should ban the bible! | Whattaya Do? Evil Shows That God Doesn’t Exist, I Don’t Think So! Atheist says Jesus was wrong about adultery | Whattaya Do? Is Racism in God’s Will? Is The New Testament Good News Or Fake News? Pain and Suffering: Do we have a problem? Why do skeptics say an eternal hell is wrong? | Whattaya Do? Skeptics say they can’t believe in God because of hell | Whattaya Do? As Christians, do we need to give evidence? Cosmic Child Abuse! | Whattaya Do? Biblical Prophecy was Doctored | Whattaya Do? Man Invented God | Whattaya Do? Evolution is true! | Whattaya Do? Why Did God Create At All? | Whattaya Do? 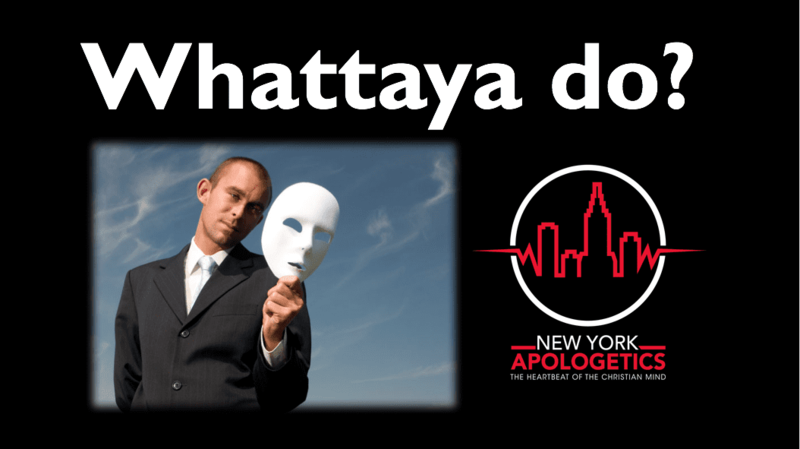 Blind Faith in God | Whattaya Do? I’m a Good Person | Whattaya Do? Bible Contradictions | Whattaya Do? Dear Atheist – Flying Spaghetti Monster? Too Many Interpretations of the Bible | Whattaya do? I Just Lack Belief | Whattaya Do? There’s Only One Way to Heaven? | Whattaya Do? God Doesn’t Answer Prayer | Whattaya Do? How Do You Know the Bible is True? | Whattaya Do? The Bible is Full of Errors | Whattaya Do? The Bible Was Copied | Whattaya Do?